Enjoy the Ride! 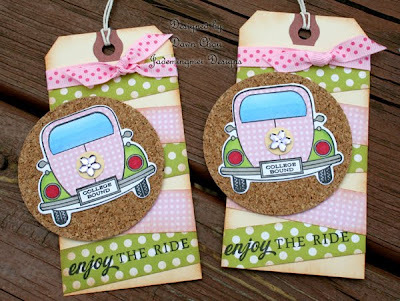 Your in for another fun post today with 'buggy' tags! 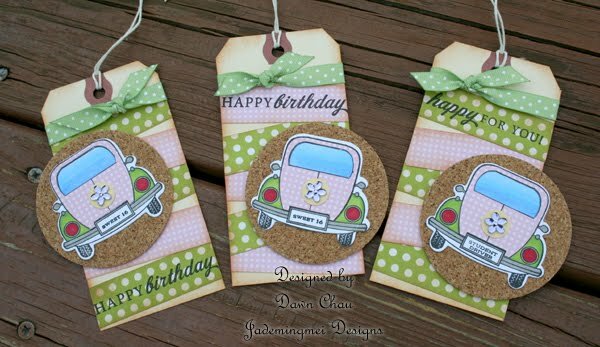 These tags were super quick and easy to make! 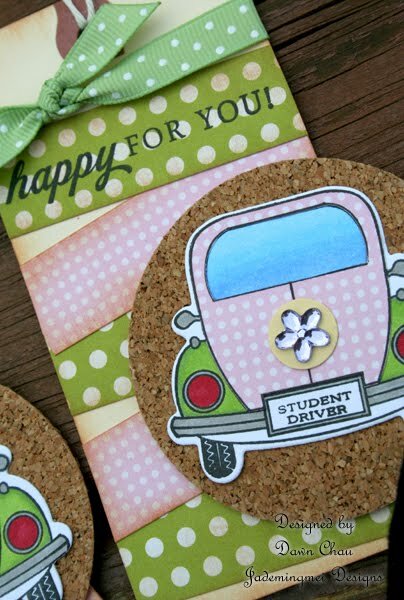 The only part that will take a little extra time is the paper piecing on the vw bug. I started by cutting 3/4 inch strips in pink and green polka dots. I used distress inks on the paper strips as well as around the entire tag. The vw bugs are paper pieced with pink polka dot paper and colored with copics. The cork circle is cut with my nesty dies and cuttlebug. The sentiments are also from Enjoy the Ride and although I hadn't intended on inking them this way, they turned out to fit perfectly on my strips. The distressing around the pink and green pieces makes it have the feel of fabric when I look at these tags. GREAT job, vroom vroom! This is so cute. I love tags...and this is so fun to wake up every day and see your series this week. Donna-I was thinking the same thing about a 'fabric' feel. I actually tried to cut some fabric with my cricut to use on these tags...recipe for disaster! i really love it, great tags!